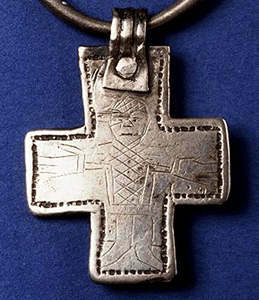 I saw a silver cross offered by a jeweller who specializes in historical reproductions. 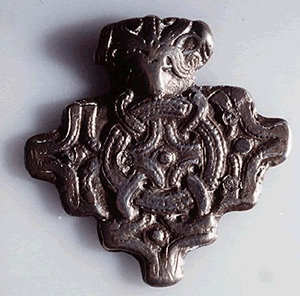 It was labeled as a "Viking cross". I thought that the Vikings were pagans -- is this accurate? 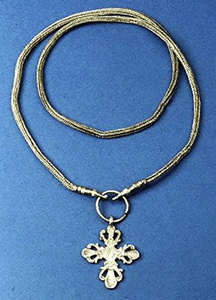 The Viking Age itself is normally considered to extend from 793 AD to 1066 AD more or less. Christianity began being officially adopted on a widespread scale from the mid 900's onward. Of course, well before that idividuals were converted, and Christian missionaries were active throughout Scandinavia throughout the Viking Age. Pagans would sometimes "hedge their bets" by accepting a type of provisional baptism called "prime-signing" (primus signatio). 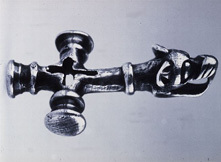 Nominal Christians would at times call upon Þórr, Óðinn and the other pagan gods if they felt that Christ wasn't responding adequately to their needs. 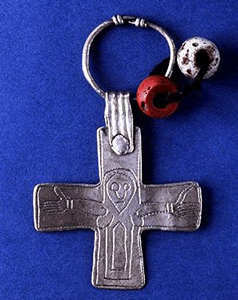 As a result, crosses, both imported and those manufactured locally using Scandinavian design elements, became a popular amulet. 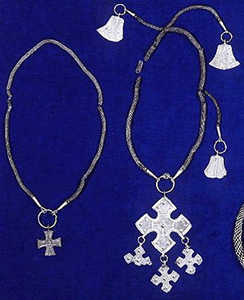 The crosses shown here are examples of Viking Age crosses. This is not a comprehensive listing by any means, but is provided to show a small sample of some of the crosses known from the Viking Age.